I only picked up four out of the nine (I think) polishes in this collection: Just a Little Dangerous, Rock His World, Dating the Drummer, and Studs & Stilettos. Just a Little Dangerous is described as a metallic amethyst. It's amethyst alright, I just don't see the metallic. I get amethyst with fine pink shimmer, which you really don't see unless flashes of unless you're in direct lighting. The depth of the color is more accurate in the second picture, only it's not quite that . This polish really reminds me of a purple version of OPI Ink. Rock His World is a gorgeous cranberry cream. 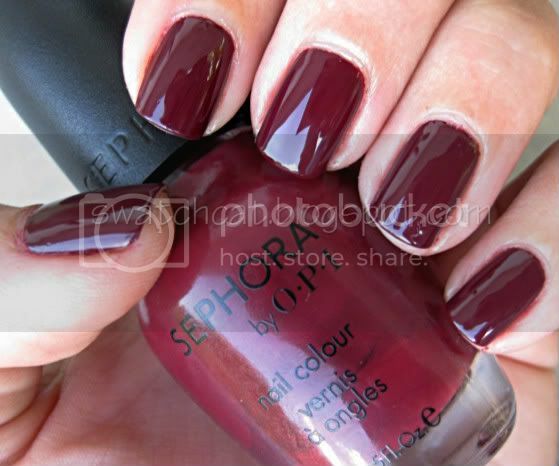 The quintessential fall color, very sophisticated, and it has me all ready to swaddle myself in a cozy sweater. It is similar to Zoya Riley which I featured in my Seasonal Selections, but not quite as pink. Dating the Drummer is a warm mahogany with supposedly holographic glitter. The glitter is super pretty in this polish, but I don't think it's holographic. I'd say more iridescent, as it flashes teal/violet and there are gold flakies in there, too. The warm mahogany is spot on, though. Reminds me of root beer...yum! If Dating the Drummer is root beer, then Studs & Stilettos is cola. It is a deep, dark brown with a smattering of silver shimmer. Again, this is supposed to be metallic, and this actually looks metallic in the bottle, but on the nails, the fine shimmer nearly disappears. Just enough shimmer peeks through and gives this brown a sophisticated touch. Studs & Stilettos is my favorite of the bunch, and makes me crave Diet Coke! These polishes are available in-store and online, and are $9 each. oooo pretty pretty! I need to check "dating the drummer" out now! I haven't noticed any formula problems with the colors I have, though I don't doubt that some colors may be more problematic than others. Plus, the brush is a skinny one, which may account for why some don't like the polishes. Those colors are really dynamic...Hi I saw your blog for the first time and it's really lovely.Have a look at mine too. I love finding new nail polish colors! Sephora really does have a good selection. Oh, I wish these were available where I live! I really like Dating the Drummer and Just a Little Dangerous.